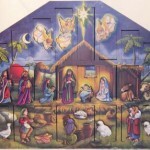 Over the years Building Faith has published many articles about Advent. Below are some of our favorites. From at-home activities, to prayers, to ideas for church life, you are sure to find something helpful for you and your congregation. Lighting the Advent wreath is a meaningful household tradition. As the candles are lit, you can say a prayer, read a Bible passage, or do a devotion. 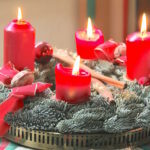 This post offers various options, including an entire Advent prayer guide, designed just for households. Emily Given, at Saint Michael and All Angels in Dallas, created this idea to help families honor Advent in the home. 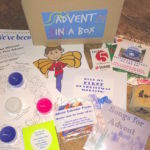 Items include prayers, candles, an Advent calendar, a glow stick (to let your light shine), and much more. 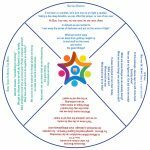 Candle Press, a formation resource provider, offers these free printable “spirals” for households to use during Advent. Each spiral has four sections: getting started, scripture, discussion prompts, and “things to notice this week.” Many thanks to Helen Barron for this gift! The Jesse Tree tradition comes from the imagery found in Isaiah 11:1 “A shoot will come from the stump of Jesse.” The idea is to create a visual representation of Jesus’ family tree, with characters from the Old Testament. Christine Hides describes the Jesse Tree she does at her church, plus the children’s skit which ties it all together. Does your church make Advent wreaths on the first Sunday of Advent? This is a terrific intergenerational activity, but it takes a lot of set-up and logistics. Kathryn Carroll has been doing it for years at her church in New York City, and has it down to a science (or an art!) In this post she shares 13 of her best tips and tricks. While making wreaths is a wonderful parish life event, the supplies can add up to a hefty sum. 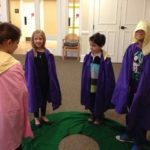 Nina Bacas at her church in Virginia developed an alternative solution that is gentle on the budget and impactful on children’s formation. 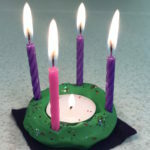 Kits with clay, birthday candles, and a few other supplies let children make wreaths that are personal and child palm-sized – just right for a bedside table or desk. One of our all-time favorite Sunday school ideas on Building Faith. This one takes a bit of sewing work ahead of time, but the pay-off it well worth it. Children wear purple and pink cloaks with yellow hoods, so as to “light their candle” by pulling on the hood. Many thanks to Gail Jackins for this charming and educational activity. Brook Packard, a formation professional and brilliant musician, shares (and performs via video) a wonderful song that children can learn for Advent. 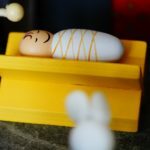 It’s all about getting ready for the baby! 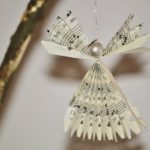 In addition, Brook has another Advent song called Show the Way. For those familiar with the Godly Play curriculum, this song matches the lesson for Advent 1. It’s more than just counting up to Christmas. 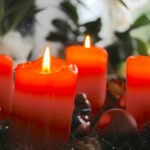 Advent is about nurturing spirituality as we prepare for the coming of Christ. We’ve assembled links to various types of Advent calendars: some online, some interactive, some traditional paper versions, and even a coloring option. We hope these help you and yours experience the spirit of Advent.